Covering various markets we develop first class quality PVC films with full dedication to our customer. Our objective remains maximum efficiency across one of the most comprehensive product ranges in the market. We have one of the widest calanders in Europe. This enables us to supply films up to 2300 mm wide and thickness from 0,04 mm to 1,5 mm. We supply rolls in various sizes. Laminated products - we can laminate films up to a total thickness of 1,5 mm. We are able to use different formulations in each layer to meet individual requirements, for example layers with different colours for each side. 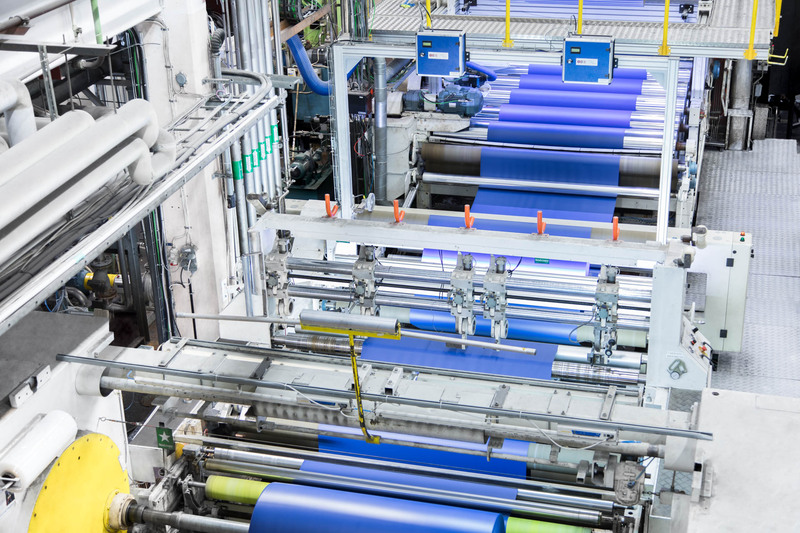 Slitting - We can slit films in widths suitable for your production or different roll lengths at our slitting and winding units. Quality control - The sheeting is continuously tested manually but also with our advanced "Vison inspection system (camera)" for particles, holes and other defects. Laminated products - we can laminate films up to a total thickness of 1,5 mm. We are able to use different formulations in each layer to meet individual requirements, for example layers with different colours for each side. Slitting - We can slit films in widths suitable for your production or different roll lengths at our slitting and winding units. Quality control - The sheeting is continuously tested manually but also with our advanced "Vison inspection system (camera)" for particles, holes and other defects.